* The Chemtrail program is also known as "Project Cloverleaf", and it is very compartmentalized. Even the pilots themselves have no real idea of why they are actually spraying. 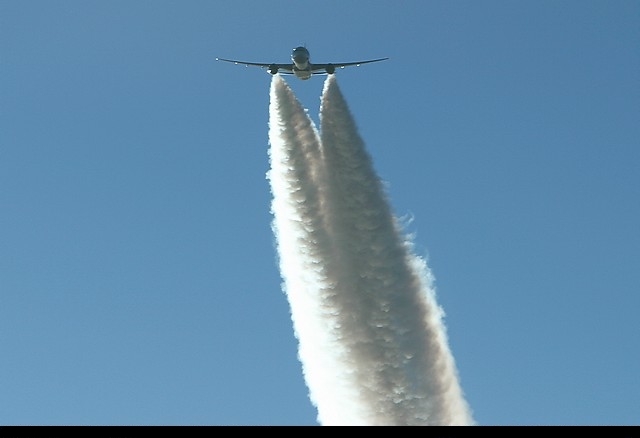 * Clifford Carnicom has identified many of the very harmful biologicals coming out of Chemtrails. * Scalar weaponry produce gravitational waves. There is nothing we can do to prevent this from happening. We are in a desperate time, and most of the people in the US are completely oblivious to what is happening, and are doing nothing because of political correctness. * Israel has protected the US from [this must have come from [i knew it (Bearden's site)--he just wants to stay alive folks (Russian)] scalar attacks on many occasions. COURT TAKES CHILD FROM MOTHER AFTER SHE MENTIONS CHEMTRAILS AT SCHOOL !!!!!!!!!! WATCH AN EXCELLENT VIDEO OF TIME-LAPSED PHOTOS!! Click here to see what a normal jet contrail should look like.